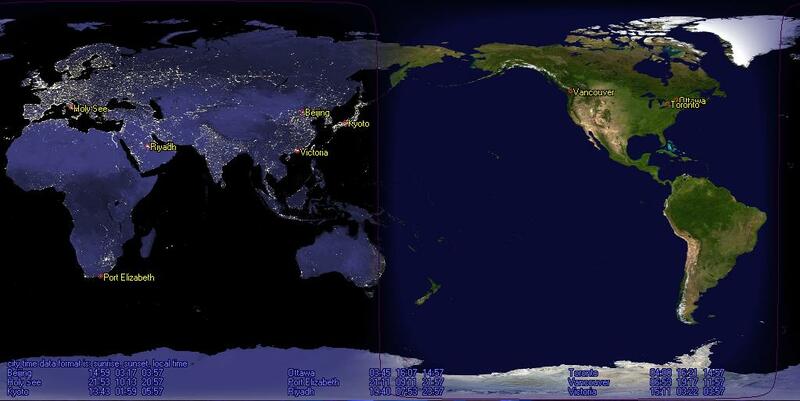 This software displays two versions of the world map, a day, and a night version, and fades between them to show which portions of the world are in daylight, and which aren't. In other words, this is a dynamic wallpaper that updates based on where the sun is relative to the surface of the earth. Version 0.12 is the most stable so far. Users of previous versions are encouraged to upgrade. If you have problems, take a look at the 'known problems' section first. Due to excessive problems with spam, both to email and to the forums, I will no longer be reading either. I may check gmail every once in a while and let google deal with the spam. A copy of the most recent license.txt may be found here. This license supercedes all licenses on this page. If you download any other than the most recent version of the software, this license applies to them as well, and you must make sure that this license file is included in any redistribution of the software. If you happened to have downloaded earlier versions of the software before this license was available, the earlier version of the license shall apply to the software: you are not required to update the license of your copy of the software just because I choose to update the license here. However, if you download another copy of the software after a later version of the license is available, you shall be subject to the terms of the latest version of the license. displays over the background image so you can see part of your background (note that non-bmp backgrounds for windows versions prior to XP will cause active desktop to be enabled). This program probably will not work if active desktop is enabled. It is known that it will not work on windows 98, 2000, and XP if active desktop is enabled (as of December, 2002). I do not intend to fix this problem as I don't use active desktop myself. Also, I suspect that the problem will not be very easy to fix without extensive rewriting. 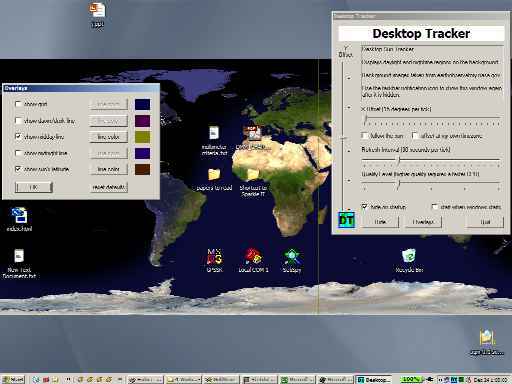 If you must use active desktop for some reason, I suggest that you use NASA's jtrack, a java satellite tracking applet which will run in an active desktop session. 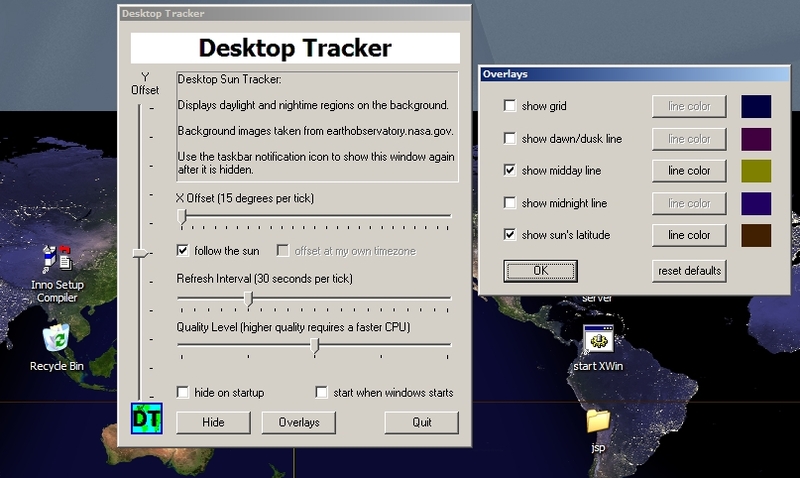 under windows XP, Desktop Tracker will not work if the 'lock desktop items' checkbox is selected (under control panel | display | desktop | customize desktop | web). if you can see the control panel, but the desktop hasn't changed, you probably have an active desktop problem. The screen does not refresh properly sometimes. This may be solved by making a window cover the desktop (e.g. by maximizing it) and then uncovering the desktop. Cities like Cairo and Jerusalem are GMT+2. Unfortunately, I still haven't hooked into a time zone database so the time zone calculations are done based on relative location to Greenwich, England. Consequently, cities like Cario and Jerusalem will be off by one hour. Thanks to David for pointing this out. Daylight savings time is ignored -- this is another consequence of not using a time zone database. Sometimes the program hangs under heavy loads. I'm not sure why yet. The solution is to go to task manager, end the explorer process, and then restart it again. You must have a desktop wallpaper selected. If you don't, desktop object icons will not have proper borders. Problems reported running this program under some installations of Windows 98... I've only tested under Windows 2000 and XP. This project makes a lot of win32 calls so porting is not feasible. In particular, the windows desktop is subclassed and hooked during operation. The rest of the code may be commonly found in many implementations (3d geometry, etc.) elsewhere. As it is currently ugly, it will not be released. Background images may be found at earthobservatory.nasa.gov or more specifically at earthobservatory.nasa.gov/Newsroom/BlueMarble. The ColorStaticST subclass (not used in version 0.8 and later) may be found here. The installer is InnoSetup, which may be found here. 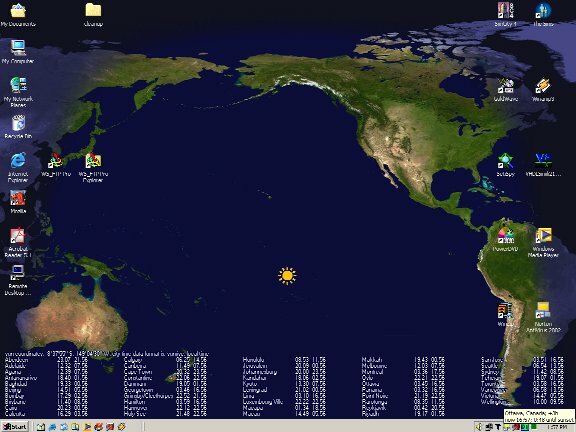 XEarth is a similar program that I found. It may be found here. You may want to use that one instead (it has a different feature set: e.g. it uses wallpaper switching instead of subclassing the desktop). Coordinate data derived from the world population dataset found at GRID-Arendal. GRID-Arendal was used because it was the first world-spanning dataset with coordinate data returned by Google. Only coordinate data is used, but if I am in violation of licensing terms, please email me and I will switch to a different coordinates dataset. Note that this coordinates dataset is not very comprehensive and I may switch to another one in the future anyway. NOAA sunset / sunrise calculation algorithms can be found here. As is common practice, you should uninstall older versions of the program before installing a new version. still available for download, but this license supercedes the one found in the archive. low resolution version (runs well for most machines) still available for download but this license supercedes the one found in the archive. high resolution version (requires a faster CPU and more memory) still available for download but this license supercedes the one found in the archive. Cities like Cario and Jerusalem are GMT+2. Unfortunately, I still haven't hooked into a time zone database so the time zone calculations are done based on relative location to Greenwich, England. Consequently, cities like Cario and Jerusalem will be off by one hour. Thanks to David for pointing this out.